AIM: To provide a stimulating physical environment in order to enhance overall motor development. 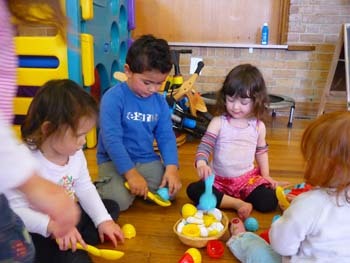 Free Play - time for the child to explore the environment, to create his/her own idea of how to use the equipment, socialization with peers and their carer and learning/practicing the skill of sharing and taking turns. Exercises - mobilization of body parts, enhance muscle tone, develop understanding of directions and interpreting them. Activity Time 1 - may include the following activities – tumbling skills, animal walks, eye-hand co-ordination, a fun activity with parent/carer. Dance - a gross motor activity where children can jump, skip, hop and stimulate the vestibular system (a part of the brain which enhances balance and co-ordination) by the parent swinging the child. 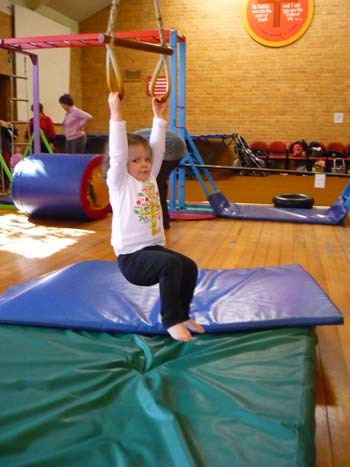 Activity Time 2 - this is specifically used to develop a child’s skill level with a particular piece of apparatus eg. bat and ball, bean bag. It will involve eye-hand co-ordination, gross motor, muscle tone and balance. Climbing - enhances muscle tone and strength, balance, spatial and body awareness, gross motor, concepts and how to climb safely. Sticks - development of the fine motor skills, body awareness, eye-hand co-ordination, following directions (both visual and auditory), rhythm. 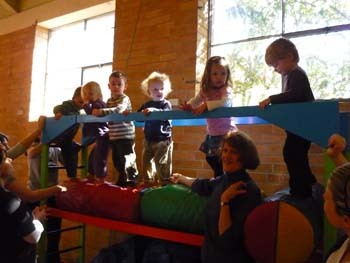 Parachute - a fun time for carer and child to come together with balloons or lizards and songs to complete the lesson.